What’s going on with the Eagles and Chip Kelly? Chip Kelly and the Philadlephia Eagles are off to a disappointing 1-3 start and a lot of that could have to do with the control Kelly has over player personnel. The Philadelphia Eagles are off to a disappointing 1-3 start in a season when expectations were high. I even picked them to win the Super Bowl (whoops). 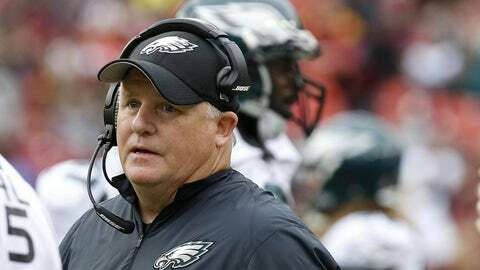 Chip Kelly, the head coach and face of the franchise, has come under fire. Kelly’s vaunted offense is ranked 27th in offensive DVOA by Football Outsiders metric — the pass offense is 22nd and the running offense his gameplans are based around comes in at 30th. For a variety of reasons Kelly hasn’t been able to get the group to function at an even average level. While the high profile signings of running backs DeMarco Murray and Ryan Matthews are catching heat, it was Kelly’s decision to release last season’s two starting guards that are hurting him most. Philadelphia didn’t properly replace Evan Mathis and Todd Herrmans either through the draft or free agency. After four games the Eagles are averaging 3.1 yards per carry, second lowest in the NFL ahead of only the Detroit Lions. For most of the first quarter of the season Sam Bradford, another Kelly acquisition, has looked like the quarterback he was with the St. Louis Rams. During Kelly’s first two seasons he was able to bump up the play of Mark Sanchez and Nick Foles, but that hasn’t happened with Bradford to this point. Bradford did show signs of life in the Eagles loss to the Redskins on Sunday. The former number-one overall pick connected on passes of 62 yards, 39 yards, 45 yards and 30 yards — the first time he’s showed a willingness to take shots down the field on a consistent basis this season. If Bradford can build on that progress and Philadelphia continues to quietly play well defensively, the season might not be the disaster it currently looks like. The Eagles have the fifth best defense according to DVOA built around a stifling front seven and stopping the run. It’s not like Kelly hasn’t had success in the NFL — he started off going 20-12 in his first 32 games with a playoff berth and +134 point differential. The difference between now and then is Kelly has control of personnel. It’s hard to reshape and build a football team in the mold you want during one offseason. Some would argue the Eagles didn’t need to be changed all that much, but the man in charge obviously disagreed. Kelly deserves more than one offseason and four games to be called failure in his new role. If the obvious deficiencies developed aren’t addressed or improved as this season goes on, or in the upcoming offseason, it’s fair to start putting more blame on the former Oregon head coach. Andy Reid started his tenure with the Eagles going 3-13 and 5-11 before steadying the franchise. Ray Rhodes started off like Kelly with two 10-6 seasons only to see everything fall apart. Rhodes lasted four years in the City of Brotherly Love. Kelly’s shown promise, but also some flaws. Whether he is able to correct his issues will largely decide whether he heads down the Reid path or ends up with a short tenure similar to Rhodes. Lets give it a little bit of time before sending him back to the collegiate level.